While I was doing Australia trip planning, I am glad that I included Canberra in the schedule. War memorial was the last place I visited in Canberra, before leaving for Sydney. Built in 1941, Australian War memorial serves as a spot to honor all those brave souls who made supreme sacrifice fighting for Australia. Reportedly it is also recognized as one of the best war memorials in the world. 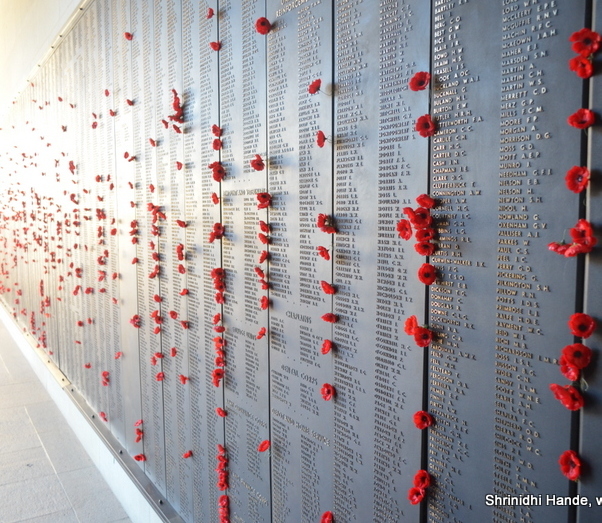 The main tower and adjoining walls list the names of every soldier/officer who died for the country. An unknown Australian soldier is berried here. It appears names are sorted by the country where the soldiers died. I could see Burma, Malaysia, Singapore etc written on the outer wall. The National War memorial building houses a museum that showcases artifacts and stories from the war. Unfortunately I had to rush through this section as I was getting late for the bus. Above: Lone Pine sculpture by Wallace Anderson. Lone Pine represents a scene on the dusk of 6th August 1045 when men of 1st Australian Infantry attacked Turkish trenches in Chunuck Bair (a hill in Turkey). Above: The entrance to Australian War memorial in Canberra, ACT. There are more things to explore around this area- such as outdoor gardens etc. I regret I couldn't spend more time here. Other related information: Entry is free. Open from 10 AM to 5 PM daily, photography is allowed but security check is involved. Getting a taxi or bus around the war memorial was difficult. From here, I literally ran till the bus terminal, which was 2 kms away and reached just in time for the bus. Back home, I feel we should build more such memorials for our own war heros. Lovely photos. The sculpture looks interesting. Very nice pics, loved it. @Purnima- glad my posts were of some help. 10 Adventure activities to try around Bangalore!